Whilst things over here have been a bit busy & hectic recently I haven’t had much to blog about. For example, we went to the opening of the new Red Ape enclosure at Chester Zoo a couple of weekends ago. It was nice. But it rained and rained and erm, rained. And we stood around, stood around and then queued in the rain. Eventually we got in & saw one Orang-utan. Yes one. Then we walked some more in the rain to get some nibbles (ok, not fab) and then hopped on the monorail for free all the way back to the car. We also helped out at the Zoe’s Place summer fete. In the rain. 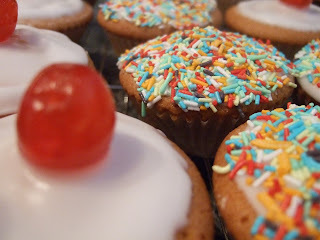 Though I did bake some delicious cupcakes thanks to my new favourite recipe from Nigella. Though they all sold quite quickly so we didn’t get a look in. However, the rain seems to have brought the baking abilities out in Mr C. Would you believe it? He was quite taken with the one cake he did manage to scoff (the one that fell on the floor, what is it with men?). So we have now seen two batches of cakes courtesy of Mr C. The first ended up getting left at my mum & dads so he had to make a second batch!! Today we decided to go out somewhere. Hubby suggested Crosby to see the Anthony Gormley statues so off we went – this is the second time we have been so I took my wellies as last time my trainers sank into the sand! Anyway, the tide was pretty much in, so we took some pictures of the statues (well, what we could see of them) and had an ice cream (Hubby has an obsession with Mr Whippy) & then we headed North to Southport where we bought a saute pan which I can use for my mexican eggs & lentil bake as it has a lid!